The results of a research study published in a poster last week show that a new bacterial strain, called Lactobacillus plantarum LPLDL®, significantly reduces both cholesterol and blood pressure with no observable side effects. The poster, authored by a collaborative team from the University of Reading, University of Roehampton, University of Bologna, Imperial College London, and OptiBiotix Health was presented at the Vitafoods Europe conference in Geneva last week. The randomised, placebo controlled, parallel- group, double blind study found that LPLDL® reduced total cholesterol by up to 36.7%, lowered LDL cholesterol by up to 13.9%, and increased HDL cholesterol by up to 6.5%. HDL cholesterol is often referred to as ‘good cholesterol’ because it helps to carry harmful LDL cholesterol away from the arteries and back to the liver where it is broken down and passed out of the body. Studies have linked low levels of HDL cholesterol to an increased risk of heart disease . Plant sterols and stanols are often recommended as natural aids to lowering cholesterol. However, figures suggest that they only lower cholesterol by up to 10%, and must be taken in optimal doses and as part of a diet low in saturated fat to be effective. 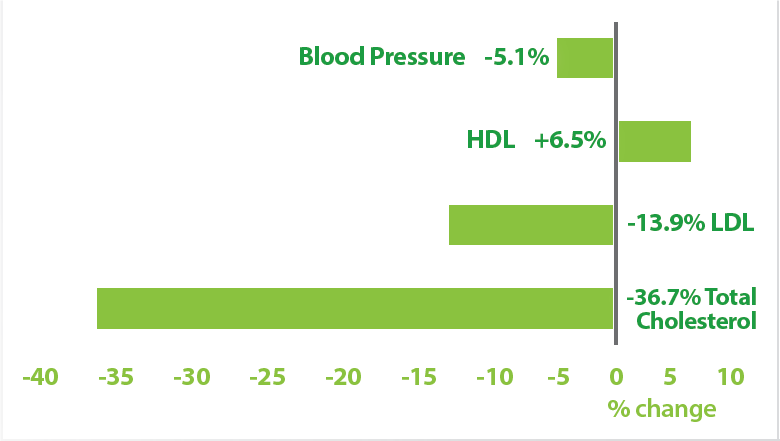 In addition to its cholesterol-lowering effect, LPLDL® was also found to reduce blood pressure levels by up to 5.1%. Both high cholesterol and high blood pressure are established risk factors for coronary heart disease, which is one of the leading causes of death across the world . This study was conducted in 49 normal to mildly hypercholesterolemic adults over a 12-week period. Participants ingested an encapsulated form of LPLDL® twice a day before breakfast and dinner. There has been considerable commercial interest in LP-LDL® following the strong results from this study. OptiBiotix Health, which developed the LP-LDL® probiotic strain, announced on Tuesday that it has entered into a non-exclusive agreement with Seed Health (‘Seed™’) to produce, promote, market, and commercialise products containing LPLDL® in the USA. LPLDL® will be commercialised by Seed™ in an innovative product concept which combines multiple strains of different probiotics which have been selected because of strong clinical trial data. Seed™ was co-founded and is led by Raja Dhir and Ara Katz to pioneer the application of microbiome science to improve human and planetary health. In collaboration with leading microbiome scientists and a global network of partners and experts in biofermentation, stabilisation, and testing, Seed™ state they have developed a new standard for a pipeline of effective, scientifically-validated probiotics that target the human microbiome. LPLDL® is already available in Europe as bulk capsules through HLH Biopharma’s market-leading Lactobact® brand, as well as in other key territories across the world. OptiBiotix was formed in March 2012 by Stephen O’Hara to develop compounds which modify the human microbiome – the collective genome of the microbes in the body – to prevent and manage human disease. The aim of OptiBiotix is to discover and develop microbial strains, compounds and formulations, which modulate the human microbiome and can be used as food ingredients and supplements or active compounds for the prevention and management of human metabolic diseases, examples of which include obesity, cholesterol and lipid distribution and diabetes. OptiBiotix has established a pipeline of microbiome modulators that can impact on lipid and cholesterol management, energy harvest and appetite suppression. The development pipeline is fuelled by its proprietary OptiScreen® and OptiBiotic® platform technologies designed to identify metabolic pathways and compounds that impact on human physiology and bring potential health benefits. These platforms are applicable across a wider range of other human diseases. Are our gut microbes the key to health and happiness? is definitely an indicator in the likelihood of developing cardiovascular disease.